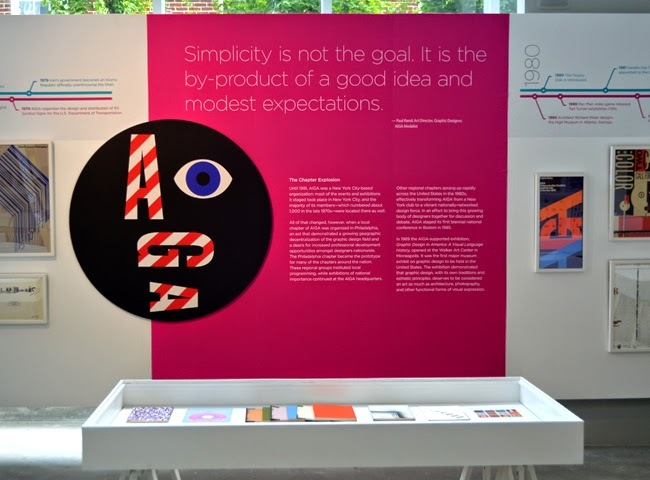 The American Institute of Graphic Arts (AIGA) is celebrating 100 years this year and the Museum of Design Atlanta (MODA) is host for their national exhibition, AIGA100: Century of Design, marking the centennial milestone. 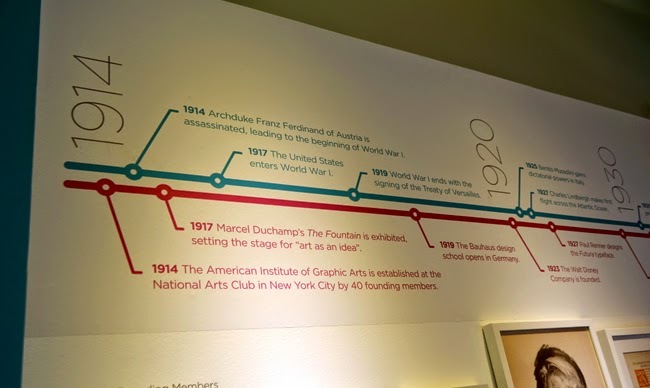 One of the first things I learned, and there's a LOT to learn in this exhibition, is that the phrase "graphic art", which even small children today understand, didn't exist yet when AIGA was formed in 1914 in New York City. 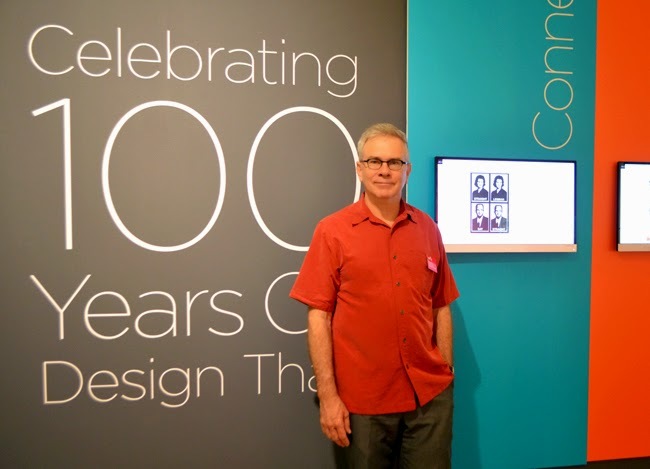 "Graphic design is ubiquitous, influential, helpful, powerful and delightful," said Doug Grimmett, co-curator of AIGA100, as well as Founder and President of Atlanta-based Primal Screen. Doug continued, "Also, the 20th century is over. So history tells us that the United States was by far the leader in the applied arts at the end of that century. But only as a result of the wars that brought brilliant artists and scientists looking for sanctuary to our country, where they thrived and opened schools." 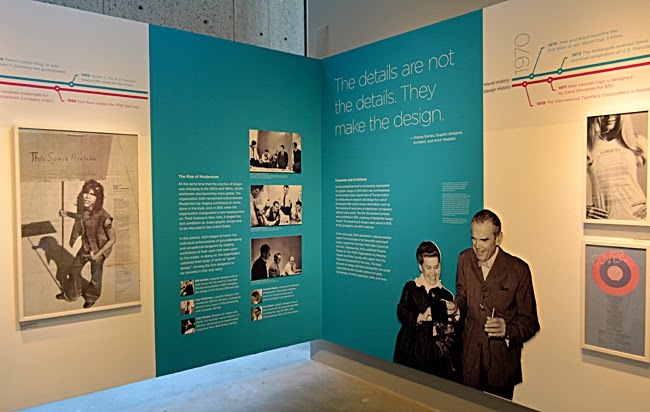 Gallery 2 features "100 years of design that...connects, informs, assists, delights, and influences". It's a brilliant concept for demonstrating the various operations of graphic art. AIGA started as a small club of graphic artists, printers, publishers and illustrators and today reaches across the nation with more than 25,000 professional designers, educators, students and design enthusiasts within 68 chapters. The map above notes the density of AIGA membership across the United States. 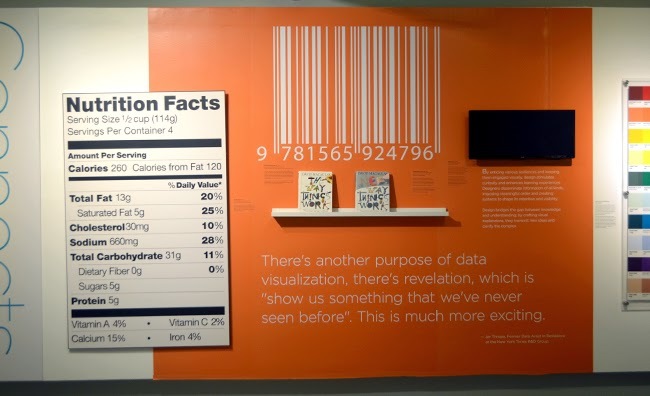 You will see many works of graphic art that have NEVER before been seen by the public--a distinguished honor for Atlanta and visiting tourists--and there's quite a bit you'll recognize, such as the above "Nutrition Facts" label. AIGA's membership has had a very active role in how we all live our daily lives, how we communicate and understand. I believe you'll be rather fascinated...as was I. When you get to Gallery 3, the large gallery toward the back of the museum, you'll quickly notice that the artifacts are displayed via timeline. Two timelines, in fact. One is a "World History" timeline--fascinatingly interesting, and the other is a "Design History" timeline. Be sure to make time to read these. The exhibit features never-before-seen (by the public) posters and publications, as well as artifacts, videos, interactive activities, audio recordings, and more. 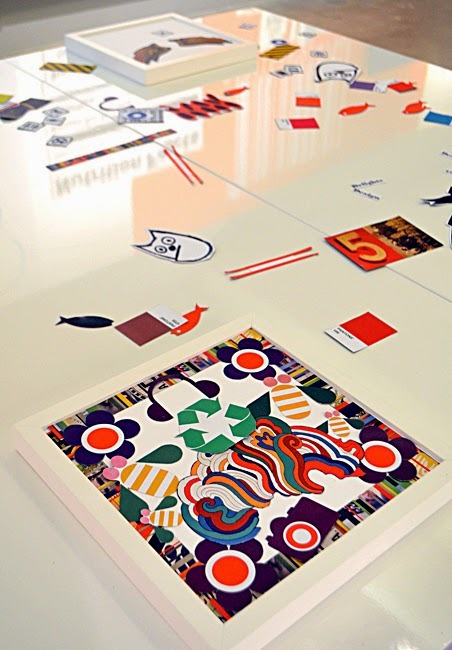 There's a lot to see, a lot to keep even the mildest graphic art enthusiast captivated! 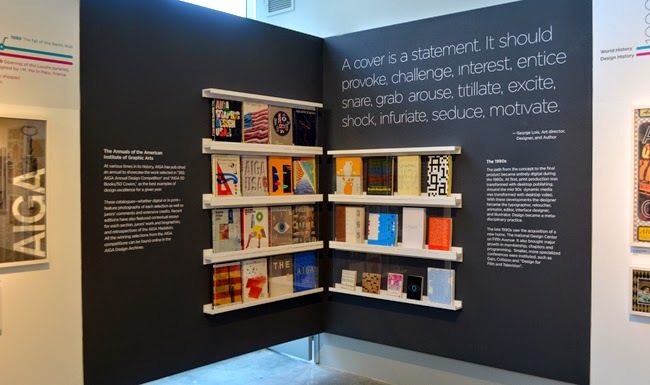 AIGA for many, many years published an annual print publication and there are many on display. My favorite is the AIGA Journal from 1969, pictured above. There are some incredibly brilliant works of art on the covers of these publications, but I personally have been mesmerized by this one. There are thought-provoking quotes emblazoned on the walls throughout the exhibition. One of my favorites, not shown in any of the photos in this particular post, is "Design is important because chaos is difficult". That gem of profoundness was authored by Jules Feiffer, Pulitzer Prize winning cartoonist and Academy Award winning screen writer. 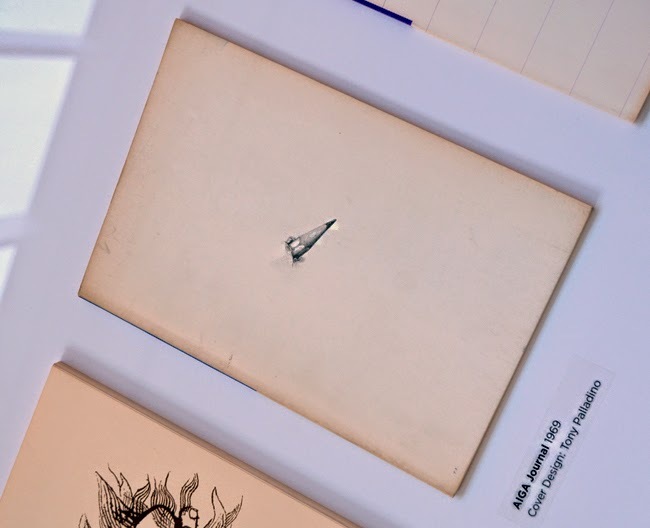 The exhibition is largely about communications, which is a primary function of graphic art. I'm over simplifying, but I think you'll understand what I mean when you visit. Through design, whether internationally recognized symbols to communicate action or non-action, to campaigns that dramatically changed our country--look for the "VOTE campaign" posters. Of course it just wouldn't be a MODA exhibition if there weren't an interactive design activity. At AIGA100, visitors have the opportunity to design a poster! Be sure to make a photo of yours and hashtag it #modatl and #aiga100 when you "publish"! Notice the color waves in the visitor-designed poster above? That element is from one of the posters, by Milton Glasser, on display in the exhibition and was an influencing factor in a Primal Screen-created promo for the final season of Mad Men. It's a brilliant and beautiful work of graphic art...I've watched it at least half a dozen times already! 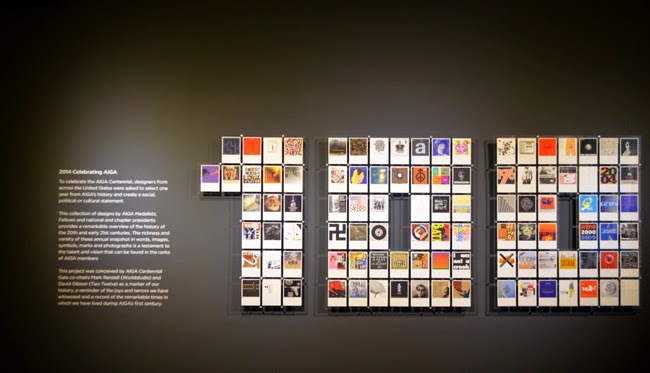 One of my favorite pieces in the exhibition is a "100" comprised of 101 postcards created by designers across the United States, each representing AIGA work from every year in AIGA history, 1914-2014. Enjoy the exhibit through Sunday, October 5, and do let the museum staff know what you thought of it and what was your favorite piece. Next up at MODA, "Inspiring Beauty: 50 Years of Ebony Fashion Fair", which is already receiving quite a lot of fanfare! There's an Inspiring Beauty Preview Party on Friday, October 17, and the exhibition will run from Sunday, October 19, 2014 through Sunday, January 4, 2015.